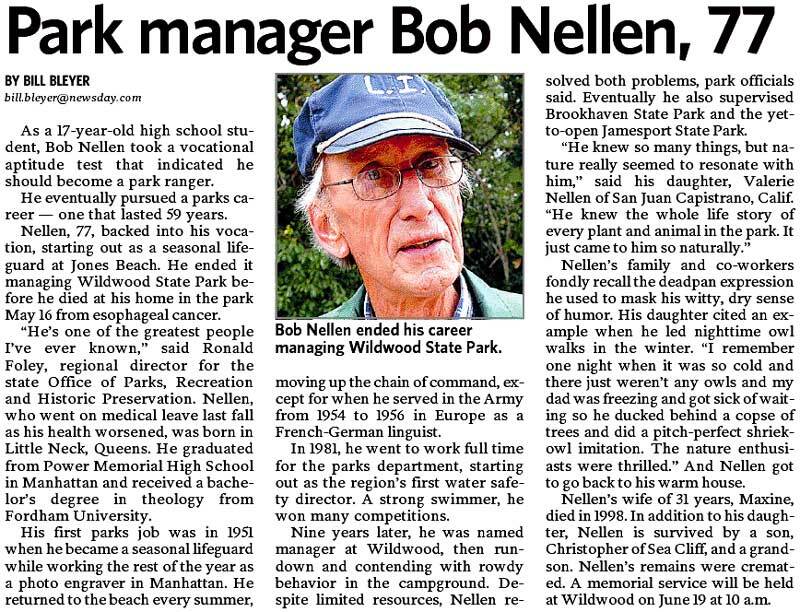 Bob Nellen started employment with Long Island State Parks in 1951 as a Lifeguard, then Boatswain and finally a Lieutenant before becoming a Coordinator. He was then appointed the Region's first Director of Lifeguards and Water Safety and, in 1990, the Park Manager of Wildwood State Park. 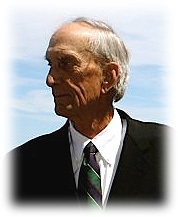 Bob was working in his 60th year when he passed on May 16, 2010. He was a man of the highest integrity who had a great love for his family, friends and parks. "He's one of the greatest people I've ever known," said Ronald Foley, regional director for the state Office of Parks, Recreation and Historic Preservation. Nellen, who went on medical leave last fall as his health worsened, was born in Little Neck, Queens. He graduated from Power Memorial High School in Manhattan and received a bachelor's degree in theology from Fordham University. His first parks job was in 1951 when he became a seasonal lifeguard while working the rest of the year as a photo engraver in Manhattan. He returned to the beach every summer, moving up the chain of command, except for when he served in the Army from 1954 to 1956 in Europe as a French-German linguist. In 1981, he went to work full time for the parks department, starting out as the region's first water safety director. A strong swimmer, he won many competitions. Nine years later, he was named manager at Wildwood, then rundown and contending with rowdy behavior in the campground. Despite limited resources, Nellen resolved both problems, park officials said. Eventually he also supervised Brookhaven State Park and the yet-to-open Jamesport State Park. "He knew so many things, but nature really seemed to resonate with him," said his daughter, Valerie Nellen of San Juan Capistrano, Calif. "He knew the whole life story of every plant and animal in the park. It just came to him so naturally." Nellen's family and co-workers fondly recall the deadpan expression he used to mask his witty, dry sense of humor. His daughter cited an example when he led nighttime owl walks in the winter. "I remember one night when it was so cold and there just weren't any owls and my dad was freezing and got sick of waiting so he ducked behind a copse of trees and did a pitch-perfect shriek-owl imitation. The nature enthusiasts were thrilled." And Nellen got to go back to his warm house. Nellen's wife of 31 years, Maxine, died in 1998. In addition to his daughter, Nellen is survived by a son, Christopher of Sea Cliff, and a grandson. Nellen's remains were cremated. A memorial service will be held at Wildwood on June 19 at 10 a.m. Worked with Robert during the period 1980-1983 when assigned as the Storehouse Supervisor at Field 10. A professional in all aspects of lifeguard service, he always performed his duties with the highest work ethic. Always recall Bob and his colleague Willie Schnell together involved in various beach operations. He will be missed. Bob was a very dear old friend from Little Neck. The kind and generous things he did for me are too numerous to recount. I rememebr the Sunday at West End Beach when a crowd gathered to watch a lifeguard swim to the end of the jetty to rescue someone. Once the swimmer was overtaken by the lifeguard, he began to fight. Both were taken in by the large lifeguard rowboat. Only when they were ashore did I see that my friend Bobby was the one who had been in such danger. He was a brave and wonderful person, who led by good example. He is missed. Bob was a dear friend from Little Neck, who knew me all of my life. The kind and generous actions he took on my behalf are too numerous to recount. He was cheerful, uplifting, fun and affectionate by nature. Bob was true to himself and loyal to his many friends. He led by example and is greatly missed. I always remember as a gentle giant. I first worked him at "0" Beach in 1962. Reggie Jones was the lieutenant, Jim Cawley Bill Robinson, Bob Gerber,Cliff Coughlin, Fred Richens, Stu Stables and a few other I can't recall. It was a great summer and was the forerunner of the West End Beaches. It is with great sadness that I learned of Bob's death while I perused the website today. Val and Chris, I'm truly sorry for your loss. Believe in yourself, is to self', is the cheap franklin marshall，cheap franklin marshall face of difficulties, setbacks and new challenges not impressed, let it be afraid. The face wholesale jerseys clothing of difficulties, setbacks, challenges as long as you are willing to believe in yourself, and constantly Supra Shoes,Supra Shoes strive to pay, even if your current life from scratch, you can do. Concerning envoy useful purses in inclusion to Cheap Wholesale Tory Burch Boots, how the lady wind up receiving placing on all of Discount Design Tory Burch Boots. Hogan shoes club sales companies offering many different products, it can be tough to find the proper one. Hogan Womens Shoes -their most successful products are through the Tad Moore line. Great!This article is creative,there are a lot of Burberry Bags Outlet,it gives me inspiration.I think I will also inspired by you and think about more Burberry Outlet.Hoping to read more interesting posts! Your blog article is very intersting and fanstic,Cheap Supras Sale,at the same time the blog theme is unique and perfect Ugg Outlet Factory,great job.To your success. Life of many people to re-state the second to the end of life timberland boots,timberland boots the pursuit of life.Accoutrement will be the age-old plus greatest greatest in the event body christian louboutin heels,christian louboutin heels frames equipped regarding paying for accoutrement purses.